The quintessential modern royal, Archana is a remarkable woman who wears her past royal heritage proudly. She keeps up with changing times by being a successful professional, and the president of luxury brand Frazer & Haws. The brand’s vintage ethos and values drew her to the company. Archana is a beautiful amalgamation of a past that is rich in history and culture, and a present that calls for a more modern way of thinking. Drop dead gorgeous and extremely polished in her demeanour and style, we caught up with the erstwhile princess about her life as a modern Maharani. 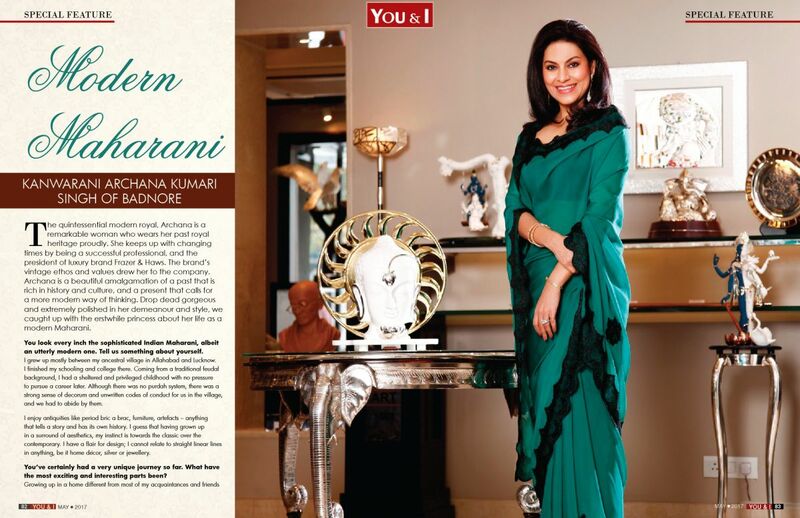 You look every inch the sophisticated Indian Maharani, albeit an utterly modern one. Tell us something about yourself. I grew up mostly between my ancestral village in Allahabad and Lucknow. I finished my schooling and college there. Coming from a traditional feudal background, I had a sheltered and privileged childhood with no pressure to pursue a career later. Although there was no purdah system, there was a strong sense of decorum and unwritten codes of conduct for us in the village, and we had to abide by them. I enjoy antiquities like period bric a brac, furniture, artefacts – anything that tells a story and has its own history. I guess that having grown up in a surround of aesthetics, my instinct is towards the classic over the contemporary. I have a flair for design; I cannot relate to straight linear lines in anything, be it home décor, silver or jewellery. You’ve certainly had a very unique journey so far. What have the most exciting and interesting parts been? Growing up in a home different from most of my acquaintances and friends in cities, and then straddling the dynamics of a corporate life have been the most challenging and interesting aspects of my life. Like a trapeze artist, the balance has to be fine tuned on a tight rope! You have a royal past and also married into a royal family. How does this heritage impact your day-to-day living? Being born and brought up in a royal family, a set of old world value systems are deeply ingrained in me, and stand me in good stead in our modern day existence. To us, royalty means conducting ourselves with dignity and responsibility at all times. Our ideas and vision towards day-to-day living is imbibed with humility, compassion, and generosity. How do you blend your royal past with today’s times? Our generation has changed and adapted phenomenally to modern dictates and contemporary living. Most have opted to live in bigger cities while maintaining their ancestral homes, and are part of the general milieu. We live and love with age-old values and a sense of integrity that in some ways set us apart. Our past is our USP that we greatly cherish and allows to lead us forward, constantly. How did you embark on the journey with Frazer & Haws? Frazer & Haws is a British brand that began retail in India as early as in 1993. It was when there was no imagination and innovation around sterling silver. F&H began retail of high design products in Delhi and the buzz went around about the brand’s quality of design, finish, and customer services. These qualities all go a long way in luxury retail. Today we have almost every vendor as well-regarded silversmiths who follow and recreate our innovations. Our challenge is to stay comfortably ahead in the game in terms of design and concepts. The journey is ever exciting with new ideas and customer preferences, and we learn to tango with the times along the way! What is your favourite part about being a royal? My favourite part about being a royal is that I have had the privilege of being exposed to refined, impeccable personal style, conduct and living. You have impeccable style. What’s your take on style, and how does being a royal impact your style decisions? My personal style is individualistic and not dictated by high trends. Of course it’s important to know and dress according to the prevailing fashion. But for me, inherent style holds more importance. What advice would you give the younger generation of royals? My advice to the younger generation would be to not follow fashion blindly. Find your personal style and build on it. Accessories are of utmost relevance, so accessorise with thought.